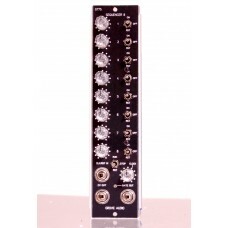 The GMS-775 Sequencer 8 module is an eight step control voltage sequencer in a 1MU panel. The sequencer also generates gate outputs which can be enabled for each step. If a sequence shorter than 8 steps is needed, there is a reset position on each gate toggle to select a shorter sequence. The sequencer has an internal clock oscillator and can also be clocked externally through the panel clock input connector. This connector also accepts a reset signal so that the sequencer can be stopped, started, and synchronized by an external controller. The MU version is housed in a 1MU (2.125 inch wide by 8.75 inch high) panel with DOTCOM compatible power connector. Preorder this module from now until Dec 31, 2018 and receive a 15% discount off the introductory price. Twenty five dollars is the preorder deposit and is returnable. If the preorder goal of 30 is not achieved by the end of the period specified above, all deposits will be returned. Preorders are also cancelable before the end of the pre-order period. Modules preordered by Dec 31 will be delivered starting on February 18, 2019. You will be contacted prior to shipment to complete the payment.